It’s taken me a while to become fond of beetroot, maybe it was all the canned pickled beetroot that adorned Australian hamburgers growing up. But now I love them and the added bonus is that they’re incredibly good for you. 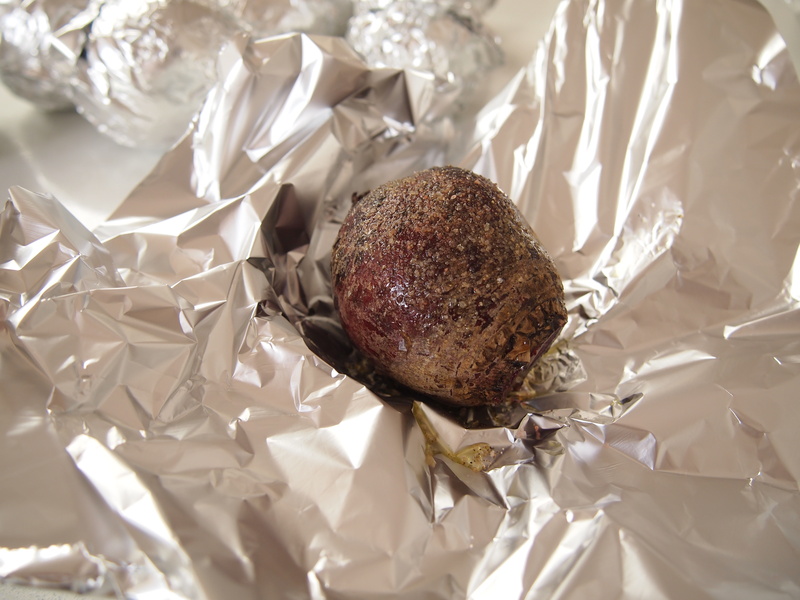 I find the easiest way of cooking beetroot is to wrap them individually in foil and cook them in the oven for about an hour until tender and then slip the skins off. They retain all their flavour and there’s very little mess in peeling them. This is a bit of a composed salad in that all the ingredients are cooked separately and then assembled neatly at the end. 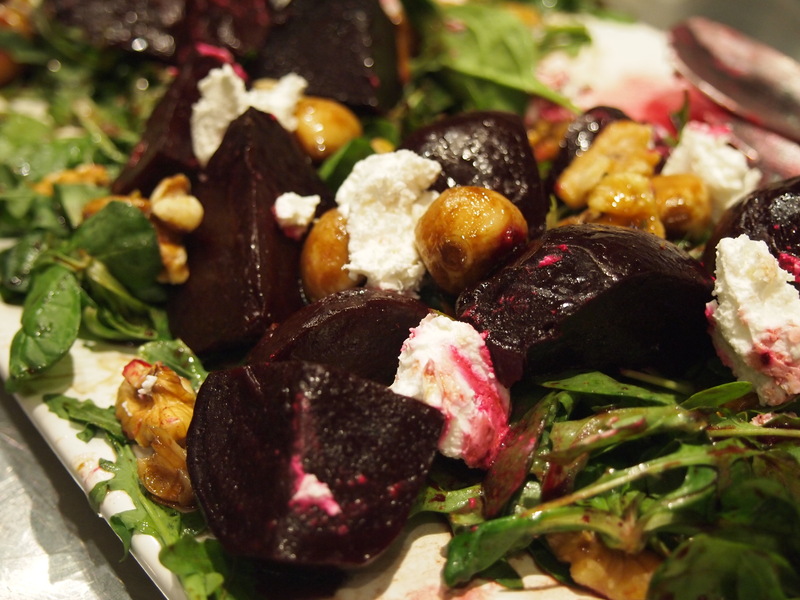 Apart from the roast beetroot and goats cheese there’s also rocket, walnuts and caramelised garlic. I was unsure about the addition of the garlic and my family members were too; some loving them and others not keen on them with the beetroot. I thought they worked quite well and made for a more interesting flavour profile. Preheat oven to 180C. Take a small sheet of foil and place a beetroot in the centre, sprinkle with salt, pepper and a small drizzle of olive oil. Wrap up tightly making sure that there are no exposed areas. Place on a baking tray and repeat with the remaining beetroot. Bake for 1 hour then test with a skewer to see if the beetroot are tender, if not place back in the oven and check again every 15 minutes. Let the beetroot cool then unwrap the foil parcels and slip the skins off, you may want to wear disposable gloves when you do this. 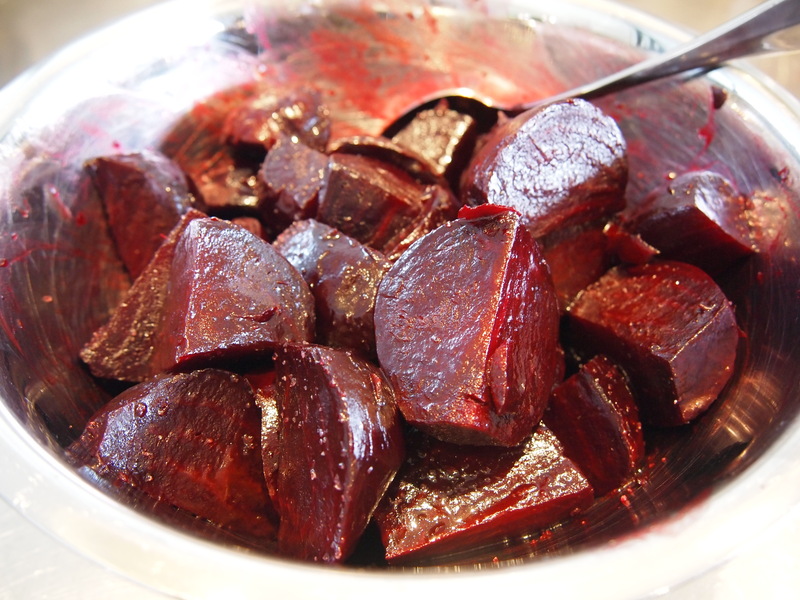 Cut the beetroot into halves or quarters if they are large and place aside. 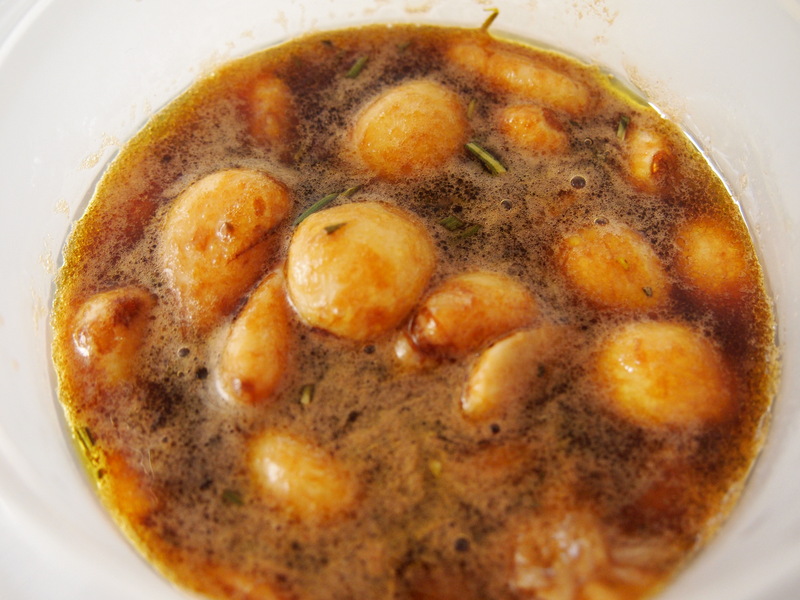 To make the garlic put the cloves into a small saucepan and cover with plenty of cold water. Bring the water to the boil and boil for 10 minutes uncovered. Drain the garlic and dry the saucepan. Add the garlic back into the pan with the olive oil and fry for a few minutes over medium heat until garlic is starting to brown. Add the water and balsamic and bring to the boil then simmer uncovered for 10 minutes. Add the salt, rosemary and sugar and simmer for a further 10 minutes. Put aside. To make the dressing combine all the ingredients in a small jar and shake vigorously. To assemble the salad place the rocket into a bowl and drizzle with a small amount of the dressing and mix lightly. Place the dressed rocket on a large platter. Add some of the dressing to the beetroot and mix gently. Place the beetroot in a single layer over the rocket. 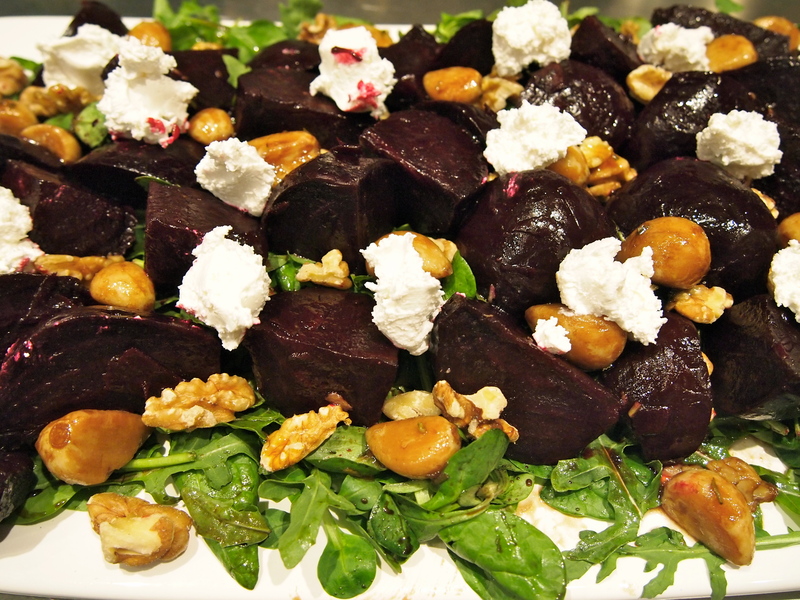 Place the walnuts and then chunks of the goats cheese on top of and around the beetroot. Place the garlic cloves around the platter and then drizzle the liquid from the garlic over the salad along with a few tablespoons of the balsamic dressing. Serve at room temperature.